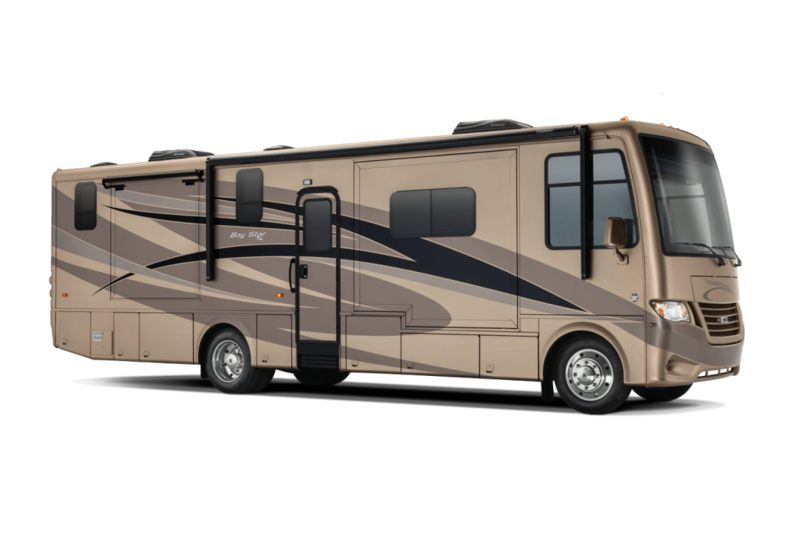 The Newmar Bay Star 3124 is a gorgeous 31′ gas motorhome that can sleep up to 5 people. It boasts a 75 gallon fresh water tank, 60 gallon grey water tank and 40 gallon black water tank. It also features a full wall slide and a slide in the bedroom. Interested in learning more? Read our Bay Star 3124 Review. At the rear of the RV you’ll find a king sized bed that is situated in a slide. On either side of the bed you’ll find nightstands. Across from the bed there’s a chest of drawers, two shirt wardrobes and an overhead entertainment area with a TV. After spending the day out and about you can enjoy relaxing in your bed and watching movies. As you exit the bedroom there’s a bathroom on the right. It comes with a 36″ shower, corner lavatory sink and a toilet. 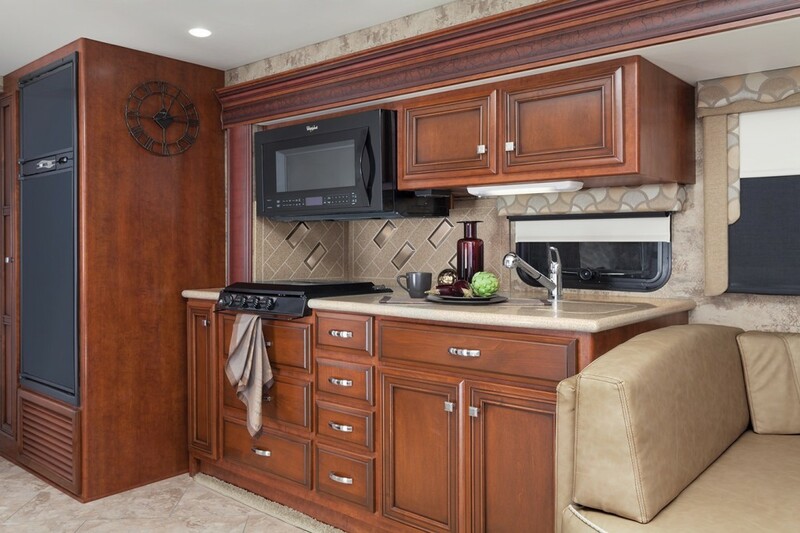 Ample overhead cabinetry provides you with plenty of space to store toiletries and towels. Across from the bathroom is a huge pantry and a linen closet situated in a slide. A dinette offers plenty of seating to enjoy homecooked meals with the family. There’s also an 84″ jack knife sofa that guarantees relaxation wherever you are. If cooking is your forte you’ll love this kitchen. It features a three burner range, double sink, refrigerator, plenty of counterspace and overhead cabinetry. If you’re interested in learning more about the Bay Star 3124 contact us or stop by to speak with our experienced team. We’re proud to offer a huge selection of class A, B and C motorhomes for sale in New York and are here to ensure you get the information needed to make the best decision for you.